Working with - and for - the DEC! For almost ten years, we've been training landscapers and turf managers in the science of non-toxic lawn care. So it was nice to be selected by New York's Department of Environmental Conservation ("DEC") to develop and present a series of DEC-sponsored natural turf management training programs for school personnel and private contractors this fall. The training programs are in support of the landmark Child Safe Playing Fields Act, passed in 2010, which prohibits the use of most pesticides on playing fields and playgrounds of all schools and day care centers in New York State. And so, in September and October, under the watchful eye of the DEC, Grassroots presented six, one-day courses at locations all across the state, and also produced a 3-hour webinar for those who were unable to attend any of the trainings in person. 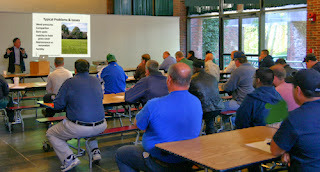 The instructor for all of the courses was nationally-recognized natural turf expert Charles ("Chip") Osborne. The programs covered all of the basics of natural turf management, including practical hands-on tips for turf managers, and won rave reviews from more than 200 attendees, including personnel from the DEC who attended as observers at each of the programs. We are glad to see our state government enthusiastically endorsing natural turf management, and proud to work alongside the DEC to help train personnel. We hope this collaboration will continue in the future.